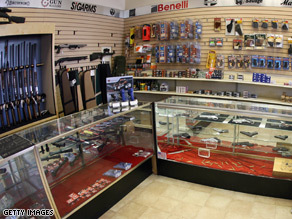 Owners of gun shops are seeing higher sales since late October. WASHINGTON (CNN) - Bernie Conatser has never seen business this good. The owner of a gun shop in the Washington suburb of Manassas, Virginia, Conatser said sales have doubled or tripled the numbers he racked up in late October. Saturday, he said, he did as much business as he would normally do in a week. "I have been in business for 12 years, and I was here for Y2K, September 11th, Katrina," Conatser said as a steady stream of customers browsed what remained of his stock. "And all of those were big events, and we did notice a spike in business, but nothing on the order of what we are seeing right now." Weapons dealers in much of the United States are reporting sharply higher sales since Barack Obama won the presidency a week ago. Buyers and sellers attribute the surge to worries that Obama and a Democratic-controlled Congress will move to restrict firearm ownership, despite the insistence of campaign aides that the president-elect supports gun rights and considers the issue a low priority. According to FBI figures for the week of November 3-9, the bureau received more than 374,000 requests for background checks on gun purchasers - a nearly 49 percent increase over the same period in 2007. Conatser said his store, Virginia Arms Company, has run out of some models - such as the AR-15 rifle, the civilian version of the military's M-16 - and is running low on others. Such assault weapons are among the firearms that gun dealers and customers say they fear Obama will hit with new restrictions, or even take off the market. Virginia gun owner Kyle Lewandowski said he was buying a .45-caliber pistol to "hedge my bets." "Every election year, you have to worry about your rights being eroded a little bit at a time," he said. But he added, "I also knew, because of the Democrat majority and because of the election, everybody would have the same reaction I did." Dealers in Colorado, Ohio, Connecticut and New Hampshire also reported seeing major increases. "It's a fact that the liberal Democrats that now control all three branches of our government do not like guns. They want us out of business," Connecticut resident Scott Hoffman said. "They don't want the average American to have a right to defend themselves." And New Hampshire gun owner Lloyd Clement said, "I think there's going to be an attack to some degree on the gun owners." He has said he supports the rights of local governments to set their own gun laws, but believes the Second Amendment to the Constitution protects individual gun rights. "I believe the Second Amendment means something. I do think it speaks to an individual right," Obama said in Milwaukee in February. With the U.S. economy in a tailspin, however, the president-elect's advisers say gun legislation is not a high priority. "What people do is their own business, and if they decide to go out and buy guns they'll go out and buy guns, assuming that they are eligible to buy guns," John Podesta, the co-chairman of Obama's transition team, told reporters Sunday. "But I think that President-elect Obama has been clear in his campaign that what he wants to focus on is the economy, trying to get jobs growing again, dealing with the health care crisis, and dealing with our dependence on foreign oil." Some customers specifically are stocking up on ammunition and point to concerns raised by the National Rifle Association, which ran anti-Obama ads during the campaign. The NRA said Obama would support a "huge new tax on my guns and ammo," referencing a 1999 article in a Chicago newspaper saying the then-Illinois state senator promoted a plan to increase federal taxes by 500 percent on the sales of firearms and ammunition. But as a state legislator, Obama would not have had any control over federal taxes. And as a U.S. senator and presidential candidate, he has not introduced or promoted such a proposal. supports it, although he says he supports the Second Amendment. But it just remains to be seen. I think some people are just uncomfortable with what his policy may be."